Being able to watch your baby while he or she sleeps at night is very important — you want them to be safe, of course. The Motorola Digital Video Baby Monitor (Model numbers: MBP33 & MBP36) is an excellent solution to this issue, and is one of the most popular baby monitors on the market. Is it worthy of such status? Let’s find out. As of Sunday, Apr 21, 2019 the Motorola MBP33 & MBP36 are on Amazon with free shipping and returns. Just click here to see the MBP33 or click here to see the MB36 on Amazon! Many baby monitors work fine in the daylight, but once it gets dark, it’s another story. The great thing about the Motorola Digital Video Baby Monitor is that is has a great LCD screen that works with infrared night vision. It gives you a very clear of your baby even if he’s sleeping in the pitch dark; you can even see if he is breathing or not. While the daytime view of the LCD is in full color, the night vision mode is black & white; this is simply how night vision technology works. Having said that, the view is still very crystal clear at night, and gives you a perfect view of your baby while he or she sleeps. However, you do have to have the camera as close to the crib as possible when it’s in night vision mode; the farther you take it away, the less clear the image gets. This shouldn’t be much of an issue, though. If you want a baby monitor that works well in the dark, the Motorola digital video baby monitor gets a thumbs up in this regard. The LCD screen is excellent, on both the 2.8″ and 3.5″ models. The larger model is obviously better, but the smaller one is adequate, too. For reference, the 3.5″ screen is roughly the same size as the iPhone – not quite, but similar enough for comparison. 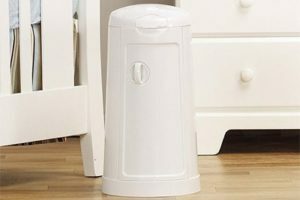 The unit is lightweight and easy to carry around the house if you have to. It also has sort of a “kickstand” on the back so that you can prop it up on a table or desk. What’s also nice about this monitor is that you can mount it anywhere, and then it can be remotely controlled with the parent unit (with the more expensive MBP36 model only). 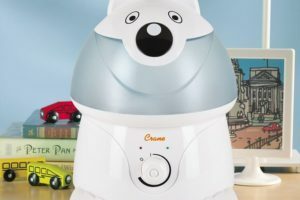 It can be remotely panned, tilted and zoomed to get a better view of your child and the room, which is always nice. 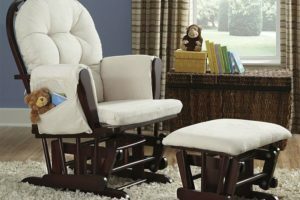 If you mount it properly, you should always be able to have a view of the entire crib – perfect for children that have a habit of rolling over in their sleep. There are buttons on the sides that control the various functions: video off/on, volume control, zoom, menu navigation, etc. They’re easy to use, and there are no complaints there. Not only does this monitor function as a video baby monitor, but it also has a great audio function as well. 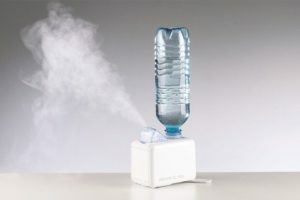 It has an adjustable volume setting, which is a much-loved feature. Some parents are light sleepers and find it very difficult to sleep with an audio baby monitor – every single whimper or small noise wakes them up! What’s nice about this monitor is that you can adjust it to whichever level you prefer. The loudest setting will allow you to hear every little move, while the lowest will only wake you when your baby is loudly crying. If you have hearing problems, you’ll be glad to know that the Motorola video baby monitor has a visual indicator that works in conjunction with the audio functionality as well. At the top of the parent unit is a light-up indicator which will show you how loudly your baby is crying. Most modern homes are full of electronic devices that emit wireless signals, from cell phones and wireless internet routers to radios, etc. If you live in close proximity to your neighbors, you might even worry about interference from their wireless devices. This actually is a problem with some wireless baby monitors, but the Motorola should have absolutely no problem with this at all. I haven’t seen any reports of issues of interference when using the monitor whatsoever. 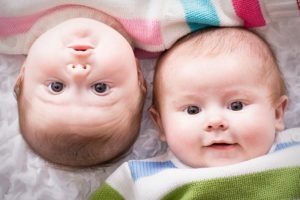 You might have heard about the recent concern that some baby monitors are insecure, allowing for anyone with a similar monitor to capture the signal of the monitor in your home. Since the Motorola digital video baby monitor uses FHSS (frequency-hopping spread spectrum) technology, a technology developed by the US military to increase protection in their wireless communications, there should be no such security risk. Temperature sensor and display: This shows you the temperature in the baby’s nursery. It’s very accurate, too. Long-lasting battery: When fully-charged, the included battery should last you about 8-10 hours. It’s recommended to have it plugged if possible, though. Two-way communication: If necessary, you are able to communicate both ways with the monitor. Wall-mountable: You can mount the camera on the wall, which can be very convenient depending on how your baby’s nursery is situated. Remote pan/tilt/zoom (MBP36 only): The higher-end MBP36 model lets you remotely control the camera to get a better view of your baby. It works in a way that shouldn’t disrupt their sleep, either. 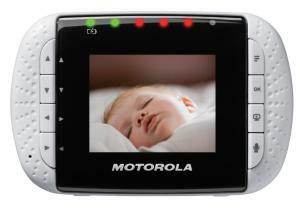 Five built-in lullaby songs: The Motorola Digital Video Baby Monitor comes built in with five nice lullaby songs. While this isn’t a major feature, it’s a nice little touch that your baby will enjoy. Expandable: If necessary, you can purchase extra camera and parent units: it works with up to 2 parent units and 4 separate camera units. (Update: As far as I can tell, although this is advertised as being able to use extra parent units, I’ve not been able to find any sold separately, nor have I found any official information stating that you can use more than one with a single camera. We personally think that the larger screen and ability to remotely adjust the camera is worth the extra money, but it might not be for you. The lower-priced MBP33 is an excellent monitor in its own right, too. Parents that want a night-vision monitor that works well even in pitch blackness. Parents that might want multiple cameras and video units. Parents that want a highly-adjustable monitor. Parents that want the best video baby monitor on the market. 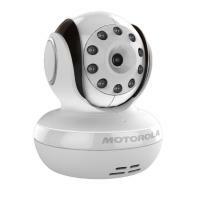 Is the Motorola Digital Video Baby Monitor Worth the Price? We think that this is the best video baby monitor on the market. It is packed full of great features, and the night vision and large LCD screens are excellent. The construction of both the video and camera units are of very high quality, and it should last you a very long time. When it comes to choosing between the MBP33 and MBP36, the main difference is the larger screen and adjustable pan/tilt/zoom on the more expensive MBP36. We think that this is worth the money and would recommend the MBP36, but if you go with the MBP33 it’s still an excellent monitor, too. Does the mp36 work in the country where there is no wireless internet or phone coverage ? Thanks for the question, Megan. Yes, it does work that way, it’s a self-contained unit and you don’t need any internet or phone coverage to use it. Does it work through concrete walls? Indi, I’m sorry, but I don’t know for sure. To be honest, I don’t think that it would, but I’m not sure any monitor would work through concrete walls. Yes it does, not through many walls but it does. Penelope, it’s hard to say for 100% sure, but there’s a very good chance it will. You’d really have to give it a try; Amazon does have free returns if it doesn’t work out for you. I believe these model numbers MBP33 and MBP36 are the old model numbers. Motorola has came out with newer models and the numbers are the same just with an S at the end. So MBP33S and MBP36S. I’m currently researching because our old model MBP36 broke last night ( the parent unit) and it looks like Motorola made the newer models to where they are not compatible with the cameras on the old ones. I’m really irritated with the entire ordeal because I spent a lot of money and I have 2 kids so 2 cameras. Now i’m going to have to buy an entire new unit. Correct me if i’m wrong though. This is just what i’ve found in the last 24 hours or so. I did contact Motorola and they asked me what was wrong with the parent unit. I told them that the on/off button has no connection and I haven’t heard back from them since. I believe this is a common issue with the older models. Lindsey, did you happen yo find a solution to this problem? We have the same issue. Thanks!